CPF Life is crucial to every Singaporean’s retirement planning. There are people who protested and demanded the government to “Return Our CPF”, but there are also many people who have good faith in our national pension system and want to top up more into CPF for their own retirement planning. 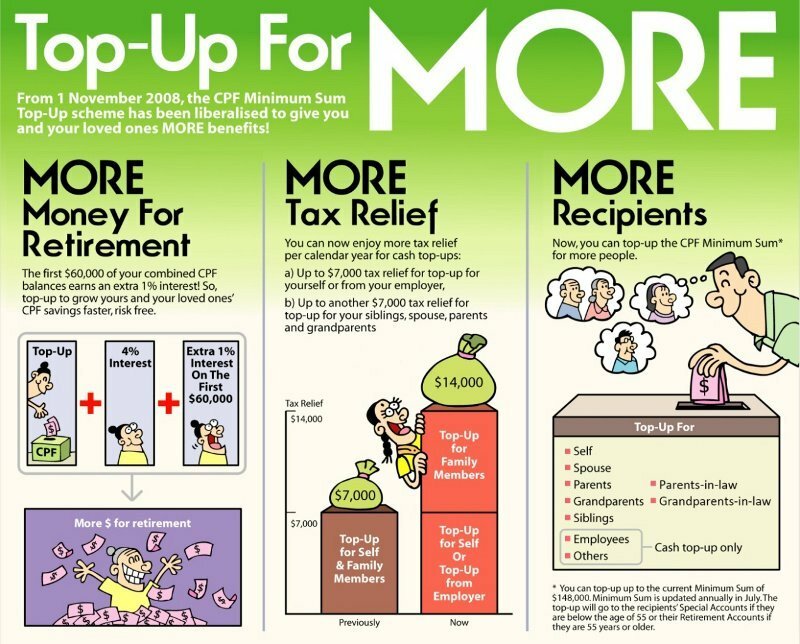 What are the benefits of topping up CPF, how much more can you top up? This article will give you the answers you need. There are two main benefits of topping CPF. These will help you boost your retirement funds. Before we get into the details of these benefits, we need to first understand the CPF Retirement Sum scheme. Because all the figures which we are going to talk about are based on this framework. Ordinary Account and Special Account are designed for your retirements. Before you are age 55, the Special account is your main account for retirement as most people will use Ordinary Account balance to pay their mortgage. 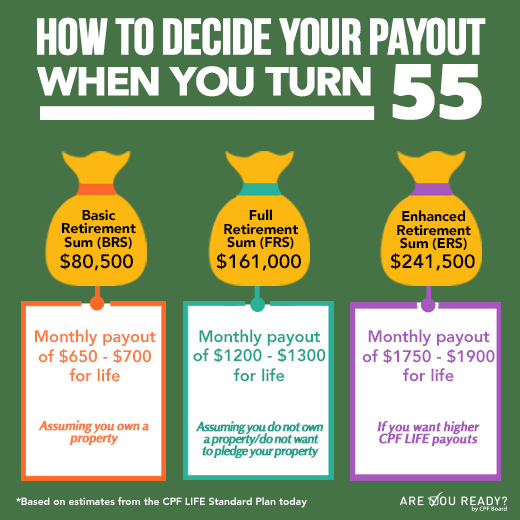 On your 55th birthday, CPF will create a new account called “Retirement Account” for you. Savings from your Special Account and Ordinary Account will be transferred to your Retirement Account to form your Retirement Sum which will provide you with monthly payouts. And this is called CPF Life. Don’t worry if you are a bit confused. These are just some terminologies. You can read here to have a better understanding of the whole system. Please remember these acronyms (BRS, FRS and ERS) as we are going to refer to them shortly. The Retirement Sum will eventually be converted to a monthly retirement income to you. Intuitively, you know higher Retirement Sum will result in a higher monthly payout when you retire. Because of these higher interests and tax relief benefits which we will talk about later, you may be tempted to allocate more of your retirement sources into CPF retirement scheme. The Retirement Sum Topping-up Scheme allows you to build your retirement savings. You can also help to build up your loved ones’ retirement savings by topping up into their CPF account under this scheme. There are two ways of topping up. CPF transfers – to specific family members only. Cash top-ups – to anyone. Since 2016, you have additional flexibility to transfer your CPF savings above the BRS to your spouse’s CPF account. Another $7,000 of tax relief per calendar year if you are topping up for your parents, parents-in-law, grandparents, grandparents-in-law, spouse and siblings. 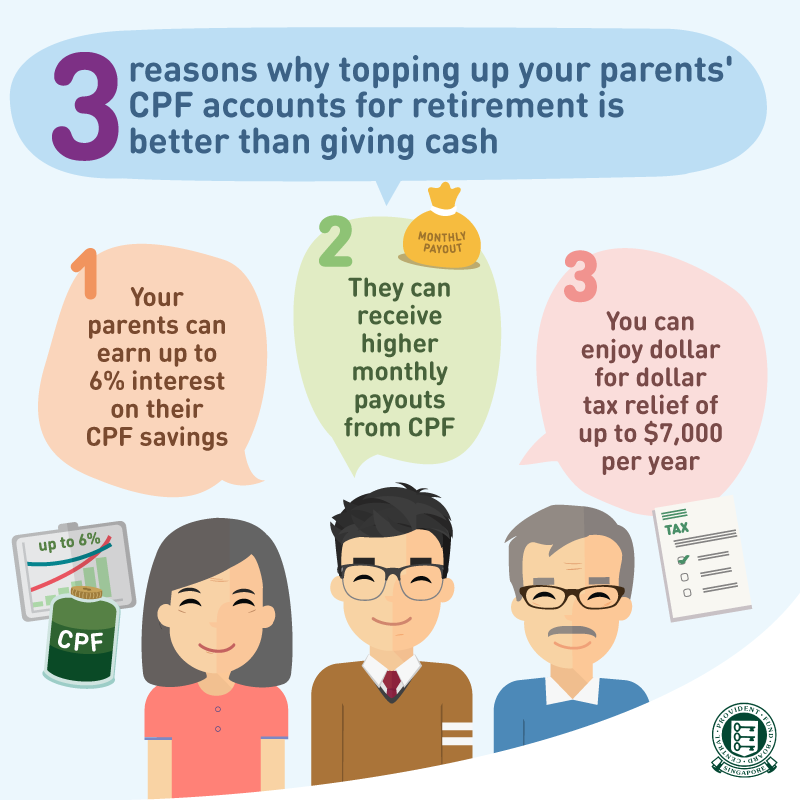 As you can see, CPF encourages you to top up to your parents’ CPF as they are not subject to such restrictions. RA savings refer to the cash set aside in the RA (excluding amounts such as interest earned, any government grants received) plus amounts withdrawn such as monthly payouts and payout eligibility age lump sum withdrawal. In summary, the tax relief cap is based on current Full Retirement Sum (FRS), rather than the Enhanced Retirement Sum (ERS). This, according to CPF, is to keep tax benefits focused on supporting basic retirement needs. But not to worry, you can check out this article for other means of additional tax relief. You need to be extremely careful when you plan to top up your CPF. This is because the cash top-ups made under the Retirement Sum Topping-Up Scheme (RSTU) cannot be refunded. At the same time, you need to note that there will be a personal income tax relief cap of $80,000 from Year of Assessment 2018. This cap applies to the total amount of all tax reliefs claimed, including any relief on cash top-ups made under the RSTU made on or after 1 Jan 2017. In another word, if you do not plan properly, you may not get the tax relief which you expected. Retirement planning can be intimating and confusing sometimes. As an independent financial adviser, I can help you navigate through the uncertainty and build sustainable retirement incomes. If you are keen to find out more, complete the form below for a non-obligatory retirement discovery meeting. You have talked much about using OA to pay off our HDB loan monthly loan amount. I agree with you that it is really not a wise thing. But I am also sucked into this unwise practice. Now after working for a few years, I only have the cash to pay off either a) the remaining loan itself; b) the OA amount which I borrowed from myself plus the accrued interest. At this stage of my repayment of the HDB loan, a is approximately equal to b. I have done the calculations and I find that option b) seemed to be better for my situation. But I am still hesitant because ultimately repaying back to OA will only grow the amount of money by 2.5% which is quite easily accomplished by putting that same amount of money in a good stable reit. Do you think it is still wise to do b) or I just continue with my unwise practice of using my OA to pay off the loan and try to invest that same pot of money in a dividend paying REITS or stocks?